Being concerned about your vessel's survivability in ultimate conditions makes ultimate sense! In view of the cost of the vessel, and the cost of the entire expedition that any ocean voyaging represents, the cost of thorough design analysis does not amount to a significant percentage of the cost of ownership. It does however amount to a high percentage of one's peace of mind on the briny deep. Michael Kasten. 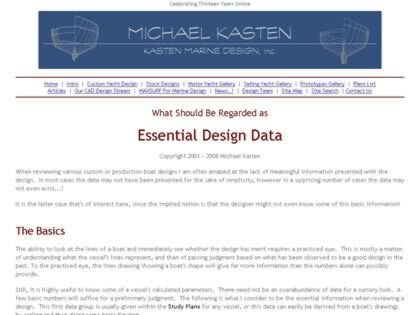 Web Site Snapshot: If available, above is a snapshot of the Essential Design Data web site at http://www.kastenmarine.com/design_calcs.htm as it appeared when this site was added to the directory or last verified. Please Note that Boat Design Net has no involvement with the above web site; all content and images depicted in the above thumbnail are the property and copyright of Essential Design Data unless otherwise noted on that site. Description: Being concerned about your vessel's survivability in ultimate conditions makes ultimate sense! In view of the cost of the vessel, and the cost of the entire expedition that any ocean voyaging represents, the cost of thorough design analysis does not amount to a significant percentage of the cost of ownership. It does however amount to a high percentage of one's peace of mind on the briny deep. Michael Kasten.